Little is known regarding Karl's grandparents and parents with the exception of information already stated on the Life Path and Apprenticeship pages. We hope to find more information in the near future. It was in 1907 that the posters in the streets of Munich announced the last concert engagement of the Johann Strauss Orchestra, the "King of Waltzes". Goetz loved Strauss' music and made it a point to attend this concert. Upon entering the Münchner Kindlkeller, he began looking for a seat with a good view. He spied an acceptable location and was seated. He immediately noticed that opposite of him sat a young lady with a slim waist, large hat, and brown doe eyes. "Soul relations even?" he said to himself. "There was no long searching, a longing—recognition —a harmony with the sound of the melodies had, as it seemed, tied us together," he states in his biography. 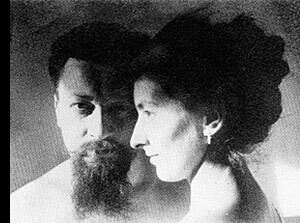 Her name was Margarete Stangl — they were married on April 27th, 1912. When Goetz married Margarete Stangl, he created K-63 to celebrate their wedding, obviously using the above photograph as reference. In studying this medal, we notice that the symbols to the left and right of the centaur (on the reverse) depict the coat of arms of the cities, Augsburg (left) and Munich (right). The coat of arms of Munich is represented by the Munchner Kindl. 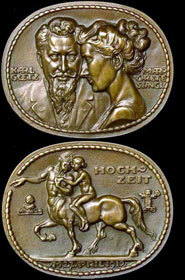 From this marriage, immortalized for posterity by this medal, three children were born; a son, Guido, in 1912, and two daughters, Gertraud, in 1916, and Brunhilde, in 1920. Goetz created his most magnificent "Family Portrait" in 1937 when he celebrated his and Margarete's silver anniversary. 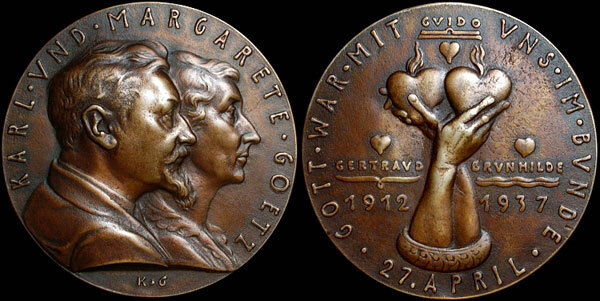 Goetz created four large portrait medallions to present to Margarete, one portraying each child, and, as the center piece, a medallion with both Karl and Margarete. 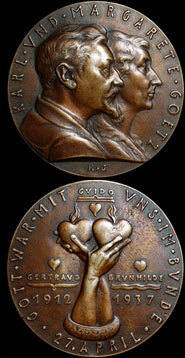 This suite of four medallions, when viewed together, is perhaps Goetz' most impressive work.